In a previous post, I mentioned that my mother had received several pictures and other items that belonged to my grandparents. In addition to the certificate that belonged to my great-grandfather, which I mentioned in my last blog post, I came across a book entitled The Muir Family Heritage Book. According to one of the first pages of the book, The Muir Family Heritage Book was purchased by my grandfather in 1984. 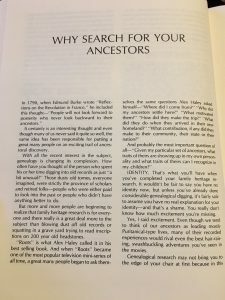 This surprised me; my mother had told me stories of her grandparents (my great-parents), but didn’t seem to know much about her family beyond them, and none of my aunts and uncles appeared to have an outward interest in genealogy. Opening the book, I expected to find a genealogy of the Muir family. Instead, the book was more of a general guide for family history. It included information on ethnic origins, heraldry, and why to research your ancestors. In fact, the only information actually pertaining to the Muir surname was in a list of Muir households across the country. It wasn’t exactly a wealth of information on the Muirs. For what it was worth, this Muir Family Heritage Book did have some really helpful genealogy forms and charts, including a 5 Generation Family Chart, and a sample letter that individuals could copy in order to contact local historical societies. However, this book was still more of a genealogy guide than an actual book on a particular family’s history. Wondering if this type of book was once popular, I began researching the publisher, Beatrice Bayley, Inc. Though various online retailers were full of similar “family heritage books” printed by the publisher, I could find very little about the history of the publication and whether it still exists today. I was, however, able to locate two news articles from the 1980s that painted Beatrice Bayley, Inc. in a less than flattering light. The Christian Science Monitor published an article with the title “Heritage books – some love ‘em, others feel cheated,” which discussed the same criticisms I found in the book; many of those who purchased the books noted that it could be found in any local library, and that the description as a heritage book was misleading. A 1985 Washington Post article, “‘Heritage’ Book Scrutiny” stated that the publishing company was investigated for mail fraud in 1980, and a case against the company was again examined in 1985. 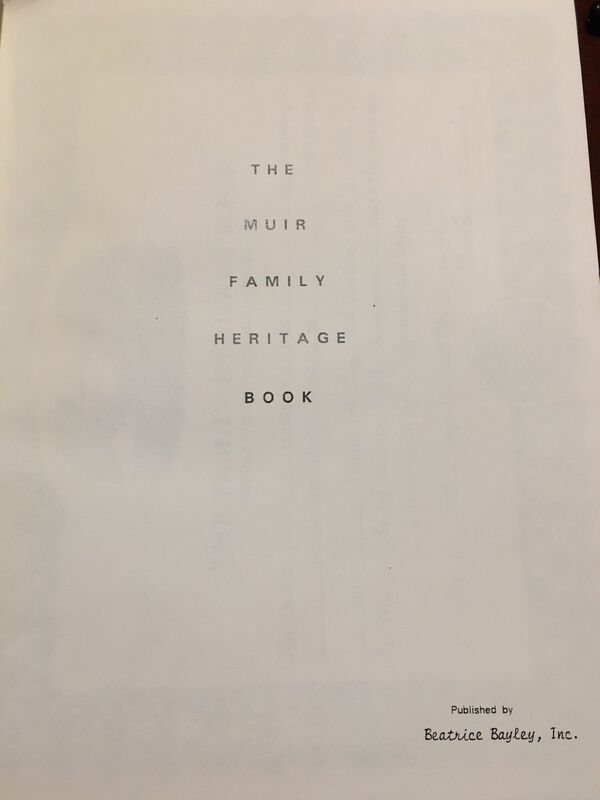 I wonder if my grandfather was expecting something different and more personalized than The Muir Family Heritage book when he purchased it in 1984. 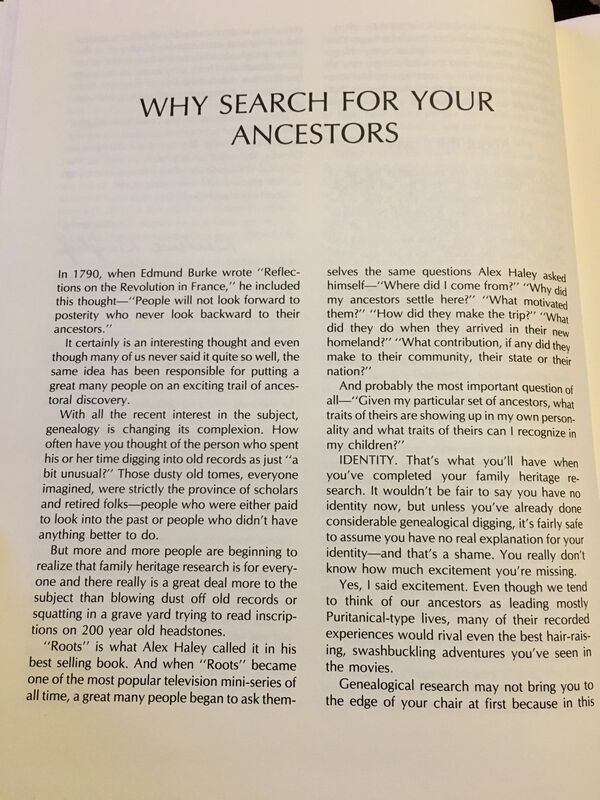 Was he disappointed by what he received in the mail, or did he appreciate some of the genealogical charts as a potential starting-off point in researching his family? Unfortunately, with a lack of writing in the book, indicating its use as a workbook, I think he may have been a disappointed customer, too. Cheryl C. Sullivan, “Heritage books – some love ‘em, others feel cheated,” The Christian Science Monitor, 28 July 1983. Accessed 23 March 2017, http://www.csmonitor.com/1983/0728/072843.html. Molly Sinclair, “‘Heritage’ Book Scrutiny,” The Washington Post, 4 May 1985. Accessed 23 March 2017, https://www.washingtonpost.com/archive/local/1985/05/04/heritage-book-scrutiny/aa459724-16ec-4a37-b6bf-2cc930ca347a/?utm_term=.96fc234b22b3. Oh, yes. My father bought one of those, too, complete with family crest, etc. oh my, do I feel old! I remember (genealogically) when these books were being spread around everywhere and so many people were disappointed! Yes, we have one that was purchased by my husband’s Uncle, he wasn’t disappointed but gave to us because he knew of our interest in research. I still have it but put a note in it to our family following us that it was somewhat of a scam. We Thanked the Uncle but knew it was really not a book about “Our,” family. and warned anyone who thought about buying it to save their money. I know what you mean Holly, it was a long time ago. My mother was the one taken in by this scam. She though, she was doing me a favor, but if she had asked I would have told her to save her money. Many companies jumped on this scam. Somewhere, unless I threw them out, were ones my relative bought–complete with family crest. They also sold them at trade shows. The list of names were usually from a national postal database. I have one purchased by my father in 1983 and produced by Halbert’s. The “directory” of Arsenaults in the back of the book is sorted by zip code, a particularly useless way of sorting. Oh, I remember those books! I didn’t buy one but one of my husband’s cousins did. Because of an uncommon last name, they proved helpful in locating “colonies” of families in the US and in Germany. One such “colony” in Iowa sent a few folks to our family reunion and then became good friends. That may have been worth the price of the book. My grandparents bought one of these books in the 1930s, and they were, of course, highly disappointed. I remember showing the postcard to my husband, and being quite disappointed when he indicated his complete lack of interest. It looks like he was right, that time! Granddad bought the Dawson one…obviously too common a name to be of any use. He was so excited to help a young granddaughter and got that darned thing. I have it still, and think fondly of his heartwarming attempt to help. Angry that he was cheated, but his thoughts made it worth keeping. We got the Pierce postcard as well, and just laughed at it. Funny how no one ever got one for Cohig or Towse……. When my father was working on the Waggoner genealogy in the 1980s, he got one of these postcards, and fell for it. It had a crest, and a short history of the Waggoners. As I recall, it was organized by zip code too. He was very disappointed, and felt like he’d been taken. I don’t know what he did with the book, which was fairly hefty. It was only that spelling. He already had a self-published family history from the 1920s, showing that the immigrant was a Hans Wagner. There was a letter from the Pension Office showing that Hans’ son served in the Revolutionary War as Isaac Wagner, but got his pension as Isaac Waggoner. We still don’t know where Hans came from–it’s like John Smith. I know what u r talking about. A close relative bought onE back in the 80’s. I did recognize several names. The other book is as described as well.